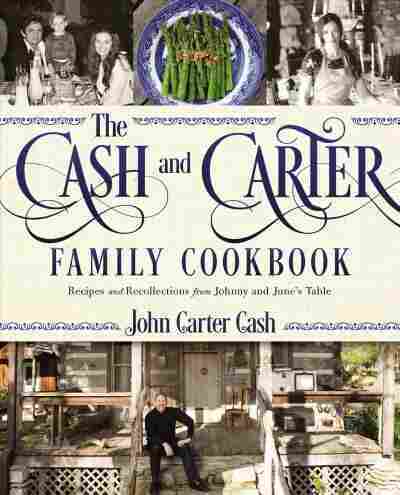 The Cash and Carter Family Cookbook NPR coverage of The Cash and Carter Family Cookbook: Recipes and Recollections from Johnny and June's Table by John Carter Cash. News, author interviews, critics' picks and more. One of the main traditional ingredients for Southern biscuits is self-rising flour, something that is not always readily available outside of the South. For those who can't find the premade mix of bleached white flour, baking powder, baking soda, and salt, this version of my mother's biscuit recipe uses regular, easy to find, all-purpose white flour. When making homemade Southern biscuits, there are a few steps that need to be carefully followed. Preheat the oven to 425 degrees. Grease a nonstick rimmed 8 x 11 or 9 x 13 baking sheet with a generous portion of shortening and set aside. In a large bowl combine the flour, baking powder, baking soda, and salt. Sift this mixture into another large bowl. Add 3 tablespoons of the shortening and the melted butter to the flour mixture, and use your fingers or a pastry cutter to evenly combine. Make a well in the flour mixture, and pour in a little of the buttermilk. Use a fork or rubber spatula to stir a small portion of the flour mixture into the buttermilk. Continue to pour the buttermilk in a little at a time, pulling more flour from the edges of the bowl until the dough is well mixed. Dust a large cutting board and a rolling pin with flour. Sprinkle a little more flour on top of the dough, leaving some on your hands, and then form the dough into a large ball. Place the dough on the cutting board, and roll it to a thickness of ½inch. Rub a light layer of shortening on half of the rolled-out dough, and then fold the dough in half. Roll the dough out again. Rub some shortening on half of the dough, fold over, and roll out again. Repeat rubbing with shortening and folding and rolling out two more times. Use a 3-inch biscuit or cookie cutter to cut out the biscuits. Place the biscuits upside down, slightly apart on the baking sheet, and coat them with the shortening. Then turn them over. You'll now have a bit of shortening on the top of the biscuits as well, which is what you want. Gather the dough scraps, and roll the dough again, cutting as many biscuits as possible. Place the baking sheet in the oven, and bake until the biscuits are tall and the tops are golden brown, about 20 minutes. Remove the biscuits from the oven and serve immediately. JOHN CARTER'S TIP: You can easily make buttermilk by adding 1 tablespoon of white vinegar to 1 cup of milk. Let stand for 5 minutes, and then stir. When I traveled to southwestern Virginia as a boy with my parents, I noticed that my mother seemed to step back in time while we were visiting her home. Particularly when she was near her first cousin Fern, my mother could really be herself. I sensed that, in her heart, she had returned to the simple strength of her humble roots, and the regal and refined lady who may have visited the White House a week before took second seat to "Little Junie Carter." I have always felt that when we grow up with someone, some strong bonds are created through joy. During those mornings at the foot of Clinch Mountain, laughter and camaraderie would accompany the wondrous food set on the table. Both my grandmother and grandfather were cooks, and their garden was full every summer. Grandmother Maybelle canned her own tomatoes after the harvest and used them for a number of her dishes, including this one. Biscuits and gravy is a Southern breakfast staple, but this variation is unique to the region of Virginia that my family is from, and as far as I know, you won't find it anywhere else in the country. Place the sausage in a large skillet, and fry over medium heat until golden brown. Be careful not to get the pan too hot as the sausage may burn. Once browned, leave the sausage and rendered grease in the pan. Reduce the heat to medium-low, and slowly add the flour, stirring constantly. Cook the flour in the sausage and grease mixture until it becomes golden, 6 or 7 minutes. Keep an eye on the grease and make sure it doesn't get too hot. Increase the heat to medium-high, and stir in the milk. Stir constantly until the gravy begins to thicken. Add the tomatoes and sugar, and continue stirring until the gravy returns to a boil. Immediately remove from the heat. Add salt and black pepper. Serve with June's Homemade Southern-Style Biscuits. Hash brown casserole wasn't cooked often at my home, but when we were visiting my family in Virginia, my mother would make it special for my cousin Joe Carter, who loved it. Joe, the second child of Sara and A. P. Carter, had a great love for music, food, and family. I remember him sitting outside the door on the front porch of the Virginia home, my mother cooking at the stove, and Joe sticking his head in the door to ask, "Hash browns done yet, June? Sure smells good!" In this recipe, frozen hash brown potatoes may be used, but shredding the potatoes is fairly easy, and to me, it makes a sizable difference. If using frozen potatoes, let them thaw overnight in the fridge, and then drain off any excess liquid. Preheat the oven to 375 degrees. Coat a 2-quart casserole dish with cooking spray. In a large bowl combine the shredded potatoes, cheese, onions, garlic, soup, and cayenne pepper, if using. Add salt and black pepper. (Most canned soups already have loads of salt in them, so keep that in mind when you add more salt.) Cut the butter into 4 even tablespoons. Press each pat of butter into the bottom of the casserole dish at even intervals. Cover the butter pats with the potato mixture. Cover the dish with foil, and bake for 30 to 40 minutes. Remove the foil, and increase the oven temperature to 400 degrees. Cook an additional 5 to 10 minutes, until the top is golden brown. Remove from the oven, and let sit for at least 10 minutes before serving. JOHN CARTER'S TIP: You can use whatever kind of potatoes you want for this casserole, but russet or yellow potatoes, like Yukon Gold, are good choices. The key is to squeeze out as much moisture as you can before mixing the shredded potatoes with the other ingredients. I first remember having Scotch eggs in Edinburgh when I was a boy. 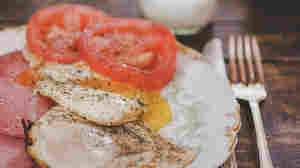 It is a delicious, single-package meal with sausage, a boiled egg, and bread crumbs — a full breakfast in a few bites. My son Jack went to Scotland with me when he was seven and never forgot his first Scotch eggs. They made such an impact on him that when we got home, he had to make some. Even at twelve, he's an accomplished cook, and this, his favorite breakfast, is one of his specialties. I love spending time with my son in the kitchen, and I'm there to offer a helping hand, especially when hot oil is involved. I recommend a nice dash of hot sauce on top of the eggs, although on travels to the United Kingdom, I have found them served often with hot mustard. Pour the water into a 4-quart saucepan, and bring to a boil over medium-high heat. Using a large spoon, lower 6 of the eggs into the boiling water one at a time. Boil the eggs for 10 minutes. While the eggs boil, place 2 cups of ice in a large bowl, and add enough water to cover the ice. At the end of the boiling time, carefully pour the boiling water into the sink, and place the eggs in the ice-water bath for 5 minutes. Remove the eggs, and peel immediately. Crack the remaining 3 eggs into a medium bowl, add the milk, and beat until combined. Pour the flour into a small bowl and the bread crumbs into another small bowl. Divide the sausage into 6 equal portions, and pat out each portion to roughly the size of the palm of your hand, being careful to make it about 1/8 inch thick. Wrap each sausage portion around a boiled egg, completely covering it. Roll one sausage-covered egg lightly in the flour, place it in the beaten-egg mixture to coat, and roll it in the bread crumbs. Dip it into the egg mixture once more, and roll in the bread crumbs again. Repeat with the remaining 5 eggs. You may refrigerate the breaded eggs at this time if you're not ready to fry them right away. Pour the oil into a deep pot or deep fryer, being careful not to fill it more than halfway. Heat the oil over medium-high heat, until it sizzles when a bread crumb is dropped in. Use a large spoon to lower each breaded egg into the oil, being careful not to overcrowd the pot. You may have to cook the eggs in batches. Fry until golden brown, for about 12 minutes. Remove the eggs to a plate or platter, and sprinkle lightly with salt and pepper. Slice each egg in half, and serve immediately. Be careful. They will be very hot. JOHN CARTER'S TIP: This is a deep-fried item. Use caution! This simple dish was a regular favorite around our table when I was growing up. My mother and Nanny "K" made it regularly. "K" was the nanny my parents hired to watch after me while they traveled. (Her name was Winafred Kelly, but "K" was short for her last name; it was easier for me to say.) My dad particularly enjoyed this dish and would often add a single slice of American cheese to the top. Heat the vegetable oil in a nonstick skillet over medium heat. Add the hot dog pieces, and cook until brown. Crack the eggs into a small bowl, and beat them with a fork. Add salt and black pepper. Pour the eggs over the hot dog pieces, stirring and scrambling the eggs until light and fluffy. Sprinkle the cheese over the egg and hot dog mixture, and remove the pan from the heat. Serve immediately with biscuits or your favorite toasted bread. The Carters were kind and gentle people, and none more so than Uncle Tube. Tube was my grandmother Maybelle's brother, and he was around a lot when I was a child. His wife, Babe, was quite a cook. I remember once visiting them in Hiltons, Virginia. I showed up at eight o'clock in the morning unannounced, but Babe already had breakfast on the table as if she knew I was coming (and these were the days before cell phones). I recall these cheesy grits that were still hot when I sat down. They were so good I ate more than I likely should have! Preheat the oven to 325 degrees. Grease a 9 x 13-inch baking dish with vegetable oil. Place the water and butter in a large saucepan, and bring to a boil over high heat. Add the salt and black pepper, and then slowly whisk in the grits. Continue to whisk while the grits boil until there are no lumps, for 1 to 2 minutes. Reduce the heat to medium-low, and simmer the grits for 5 minutes. Remove the pot from the heat. Add the cheese to the grits, and stir well. Crack the eggs into a large bowl, and beat them well with a fork. Add the milk, garlic, paprika, and cayenne pepper. Stir to combine. Slowly pour the milk mixture into the grits, and mix well. Spoon the mixture into the baking dish. Bake uncovered for 50 to 60 minutes, until the mixture is set. Remove the pan from the oven, and allow the grits to stand for 5 minutes before serving. Pour the water into a medium saucepan, cover, and bring to a boil over high heat. Melt the butter in another medium saucepan over medium heat. Add the oats, and cook until they begin to brown, 1 to 2 minutes. Pour the boiling water over the oats, and bring the mixture to a boil. Reduce the heat to medium-low, and simmer the oats uncovered for 15 minutes, stirring only occasionally. Add ½cup of the whole milk, and simmer for an additional 10 minutes or until milk is absorbed. Combine the remaining ½ cup of milk with the buttermilk in a small bowl. Pour the milk mixture over the oats. Add a pinch of salt. Cook for 10 to 12 minutes more or until desired thickness. Serve in a bowl with a small dab of butter, a sprinkling of brown sugar, and a dash of buttermilk. Place the sausage in a medium skillet, and cook over medium heat, using a large spoon to crumble the sausage, until browned. Transfer the sausage to a large bowl. Place the hash browns in the same skillet, and cook, stirring constantly over medium heat, until the potatoes begin to wilt, 4 to 6 minutes. Add the salt and black pepper to taste. Add the hash browns to the sausage, and stir until combined. Cut the butter into 6 pieces, and place them evenly in the bottom of a 9 x 13-inch or 2 ½- to 3-quart baking dish. Place the slices of bread over the pats of butter, covering the bottom of the dish. Pour the eggs over the bread. Spread the sausage and hash brown mixture over the eggs. Cover the pan with foil. Place the pan in the oven, and bake for 10 minutes. Remove the pan from the oven, remove the foil, and top the frittata with the cheese. Return the pan to the oven, and bake, uncovered, for 7 minutes, or until cheese is completely melted and beginning to brown. Remove the pan from the oven, and let stand for 10 minutes before serving. This Fresh Berry Compote is easy to make and tastes delicious with pancakes. My mother also served it with her Heavenly Hash and Cheesecake (recipes in chapter 6). To prepare the compote, place the butter in a large saucepan, and melt over medium-high heat. Stir in the berries, sugar, and salt, and bring to a boil. Reduce the heat to low, and cook the berries, covered, for 30 minutes, stirring occasionally.